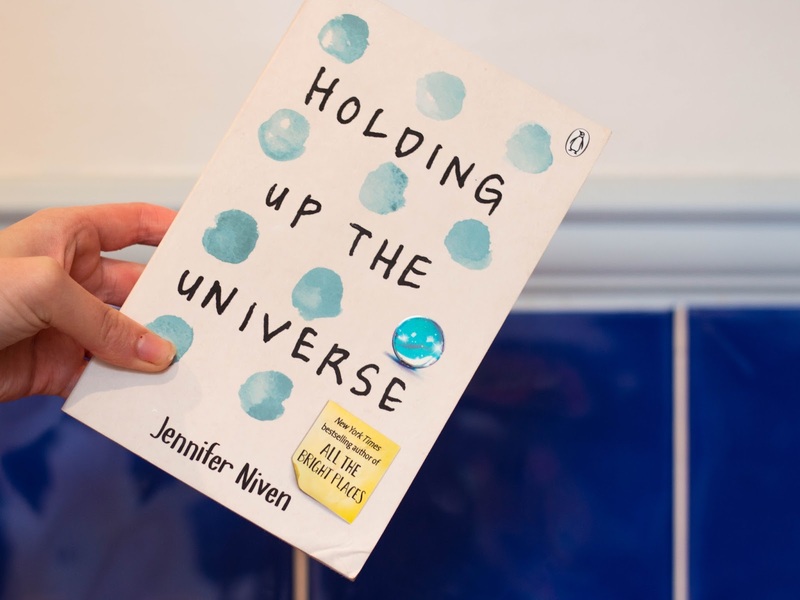 A book I was very excited to read was Holding Up the Universe by Jennifer Niven, as I previously read her novel All the Bright Places, I realised she was a great writer, and that I felt very connected to her words. I was pleasantly surprised to find I enjoyed reading Holding Up the Universe even more than All the Bright Places (shock, I know). I found the characters in Holding Up the Universe felt a lot more real and although it touched on mental health which I think is a good thing in a book, there was a lot more to the story, I found All the Bright Places just made me feel a little down as the story was so deeply surrounding mental health issues. Holding Up the Universe is written in two different perspectives and the narrator switches with each paragraph change. I love hearing multiple views in a book, I think it gives the reader a clear picture of the story being told, it also shows the writer is invested in all of the characters, and it's just more interesting - having said this, if this is done badly, it can become too confusing and ruin a good book. I'm pleased to say, this wasn't done badly at all in this book, in fact, it was done really well. It was always very clear whose eyes you were looking through and both characters were so interesting, I think it was important for the story to be written in the minds of each of them. The story takes place in a high school (as many young adult novels do!) It is based on two characters, Jack and Libby. Both Jack and Libby are not your average teenagers. Libby was once the fattest teen in America, to the extent part of her house had to be knocked down to get her out. Libby has now lost some weight and is ready to lead a normal teenage life - which of course means going back to high school. Jack has his own problems - he has a medical condition which means he is unable to recognise faces - friends, family, teacher, strangers, anyone, Jack cannot recognise them. Jack is keeping this to himself, keeping his head down by trying to fit in with his "popular crowd" - which leads to some bully, that Libby being an easy target receives the brutal end of. And then everything changes are Libby and Jack, ironically grow closer due to these strange nasty circumstances. The book talks a lot about bullying, high school cliques, and fitting it. It also deals with subjects such a death, separation, unhealthy relationships, cancer, virginity, the internet, and being a teen - there are a lot of important themes running through this book, and they all fit quite naturally into the story. I really liked both Jacks and Libby's characters. Each of their characters made me think, they made me consider how I treat people, and really reminded me that everyone is going through their own things, which you may not know about. I think the character they worked really well together and seemed very real. I wish some of the smaller characters played a bigger part. There were a lot of characters I would have liked to have learnt more about - however, they weren't necessarily all that important in the narrative. I loved this story, however, the ending was a tad cheesy, but who doesn't love a bit of cheese? I'd strongly recommend this book. I couldn't put it down!